Everyone remembers playing "dress up" as a child, whether in Mom or Dad's clothes and shoes or in costumes for Halloween or every day play. Most people view this playtime as simply that - play. While it is a fun activity for kids to engage in, dressing up is also an educational activity that can help them learn in various ways. Probably one of the most popular ways that children like to dress up as is that of a doctor or nurse. Many children dream of becoming a doctor or nurse and caring for others from the time they are quite small, taking care of baby dolls or other dolls or figures. Being able to dress up and act out the kind of profession they are interested in helps them to explore new possibilities for their future. What adults see mostly as just playing is the way in which children learn about others and the world around them. Doctor play kits have been popular for many years and now kids can have professional-looking kids scrubs to go with their playtime. At www.mykidsscrubs.com, we offer a large variety of kids scrubs, lab coats, gift sets and stethoscopes to outfit your little one exactly the way they want. We have some of their favorite colors such as pink, purple, teal, red and black with sizes from 2 to 12/14. They can also wear one of our professional-looking lab coats to feel like a real doctor! Our products at mykidsscrubs.com are designed to be high-quality, affordable alternatives to some of the other higher priced competitors out there. These are not "costume" products like others may have, but durable garments that your child will be able to wear over and over for many hours of fun playtime! If your child dreams of becoming a doctor or nurse one day, now they can have the look to go with their dream. Make your child's playtime even more fun with genuine-looking kids scrubs for them to wear. Right now, we are offering a free scrub cap with the purchase of any scrub set, so your child can have the complete look! Order yours today for hours of exciting play tomorrow! Children are often asked what they want to be when they grow up. While we never expect a serious answer, it seems like second nature to encourage children to think about the future and dream big for themselves. Instilling a sense of self-confidence and active imagination in children at an early age can give them a huge advantage in school and beyond. Besides fostering a love of learning and lofty ambitions, dress up play is also an important activity for helping children build their vocabulary and social skills. If your little tyke proclaims that he or she wants to be a doctor, then considering encouraging that goal with a set of authentic kids scrubs. By providing fun and authentic options for dress up play, you will actively send the message to your child that you believe in his dreams and that learning can and should be fun. Gathering the right supplies for your child's dress up play is easy and fun. My Kids Scrubs carries a wide variety of authentic kid scrubs in different prints and colors to match your child's personality. When you visit www.mylittledoc.com, you will also find many options of play doctor accessories to complete your child's dress up wardrobe. By completing your child's dress up wardrobe with accurate replicas of medical tools, such as stethoscopes, doctor bags, scrub caps or lab coats, will keep his interest and may even encourage role playing socialization. As an extension of dress up play, role playing with other children is an important way that children socialize and build interpersonal skills. If children are equipped with interesting toys, such as a stethoscope along with their scrubs, they will be more inclined to act out the role of playing doctor with other children and actually visualize themselves as a doctor someday. This will eventually lead to more active learning on the child's part and an eagerness to explore activities that relate to their career interests. Something as simple as child's play can have a lasting influence on your child's educational and interpersonal development. If you want to encourage active learning and self-confidence in socialization for your child, check out www.mylittledoc.com for plenty of fun options for authentic kids scrubs and related medical toys that your child is sure to enjoy for hours on end. Giving your child the tools to learn and play is a small investment with potentially huge rewards for her future. 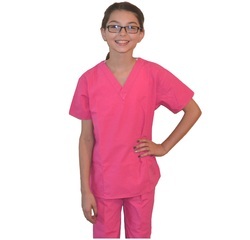 The My Kids Scrubs online store offers kids scrubs that are made of a high-quality material similar to adult medical and health care clothing. This means parents and teachers can machine wash and dry the shirts and pants frequently to keep the items sanitized. Children wearing these garments remain cool and comfortable in the durable polyester and cotton blend fabrics. The pants have an elastic fabric covered waistband to make the garment easier for a growing child to wear. The shirt has two front pockets to hold pretend medical instruments, and the slacks have one pocket on the seat. 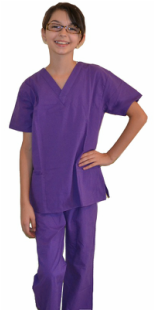 Teachers and parents can find kids scrubs in small sizes for toddlers or larger sizes for older children, making it simple to find a size for different ages of children. Children look adorable wearing clothing that resembles what a doctor or nurse wears, and many parents and teachers take photographs of children wearing these garments. If a child is going to enter a hospital to undergo treatment or surgery, then wearing the uniform of medical staff can help to ease their fears. Additional customization is available in different font styles and colors to stitch names or words on a shirt’s left chest above the pocket.